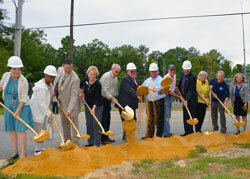 On Sept. 9, 2014, the Board of County Commissioners celebrated the groundbreaking for the Dowell Road widening project. The road improvement project will proceed in three phases and include upgrades to enhance motorist, bicyclist and pedestrian safety. Improvements will start at H.G. Trueman Road and continuing to just past Appel Lane for a total distance of approximately 3,400 feet. Improvements continue from Appel Lane to Dowell’s Country Store, approximately 1,200 feet. Completes the final 1,150 feet of road improvements from Dowell’s Country Store to The Harbours at Solomons. View additional project details here. Phase One of the Project is complete and the sidewalk improvements continue to receive positive comments from the community. Phase Two of the project continues but expect construction to slow down through the winter months. Some installation of the storm sewers will continue during the winter. Construction of Phase Two will continue from Appel Lane to Oyster Bay Place and is scheduled to be completed by the end of next year. Thank you for your patience and please remember to slow down through the work zones to less than 30 miles per hour.